No sooner does a new bit of PlayStation gaming kit arrive from Sony Computer Entertainment than some bright spark decides to pull it to pieces and closely examine its innards. While we will have to wait until we get our own PS3 Slim in for thorough testing to find out how it differs to its slightly larger older sibling, it is clear from these first PS3 Slim 'tear downs' that quite a lot of the interior space of the machine is dedicated to cooling the heat pumping out of the machines CPU. Note the rather obvious 95mm-wide 17-blade fan and the big chunk of custom molded plastic which routes the air from said fan over the heatsink. The new 120 GB drive is a Toshiba-manufactured, 5400 RPM SATA drive. 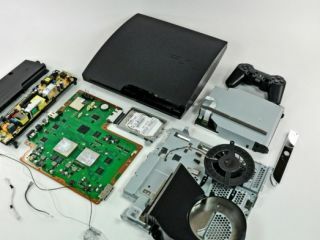 Other than that it seems that Sony has generally used the same chip manufacturers as it did for the original PlayStation 3. In the meantime, we are informed by SCEE that the first batches of PS3 Slims are now making their way to UK retailers, so you might want to pop into your local gaming emporium and slap down some pre-order cash to ensure you get hold of the new PS3 on day one. For all the recent news on PS3 Slim from GamesCom check out TechRadar's recent, fully-detailed coverage.